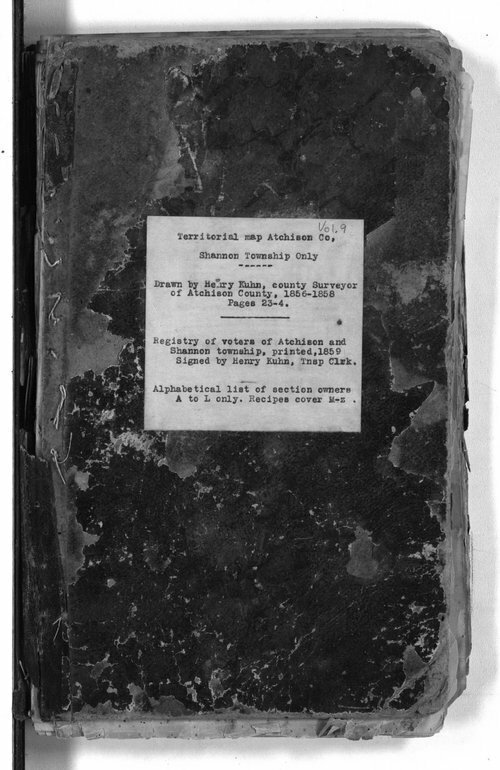 This record book includes a territorial map of Shannon township, Atchison County, Kansas, drawn by Henry Kuhn, county surveyor of Atchison County from 1856-1858. It also includes a registry of voters of Atchison and Shannon townships printed in 1859 and signed by Kuhn as township clerk. It also includes an alphabetical list of section owners. Later the book was used to record cooking and baking recipes. Henry Kuhn was born in Franklin County, Pennsylvania, on February 2nd, 1830. In 1854 he moved his family to Atchison County, Kansas Territory, where he was the first superintendent of public instruction, county surveyor, and helped organize the First National Bank. Kuhn enlisted in the Eighth Kansas Infantry in September 1861. He served under Colonel John A. Martin (Kansas Governor 1885 - 1889) until the end of the war. His last active rank was commissioned Captain. From 1865 to 1891 he resided at Fort Leavenworth where he organized the German Savings Bank, built the city's first railroad, and was chief clerk and acting agent for the Indian agency in Indian Territory (Oklahoma). Then he moved to Marion County where he farmed and raised stock. In 1890 he began publishing the "Marion Times." In February 1899 he moved back to Atchison and published the "Atchison Champion." In the autumn of 1899 he moved to Topeka where he died June 11th, 1900.